We already looked at some firearm myths several months ago here and here. We will look at some more myths in this post. The class of myths we will look at in this post generally have movies to thank for spreading the myths. 1. If you drop a pistol, it will go off when it hits the ground. You've probably seen this scene enacted in several movies. Someone accidentally drops a pistol and it automatically goes off with a bang when it hits the ground, usually killing some villain's sidekick while it does so. For example, there's the scene in the movie, True Lies, where Jamie Lee Curtis drops her gun down the stairs and ends up shooting a whole bunch of people. You want the truth? The probability of this happening was certainly higher with older model pistols, so it might make sense if it happened in a cowboy movie. With more modern designs, this is much less likely to happen, especially with models manufactured since the 1980s or so. This is because there are devices called drop safety devices that are designed, precisely to prevent this from happening. In fact, we discussed these devices in posts here, here and here last year. And most modern pistol designs include one or more drop safety devices built in. As a matter of fact, the US military as well as NATO and some other countries' militaries require pistols to pass several drop tests before acceptance. SAAMI standards which are followed by most manufacturers in the US (as well as some foreign manufacturers selling products in the American market) also require pistol models to pass several drop tests. As do some states in the US (for example, California and Massachusetts, though the test standards for each state are different). The US Federal Gun Control Act of 1968 also introduced drop tests for imported gun models. On top of that, most reputable manufacturers add drop safeties to their designs, because they don't like lawsuits. Why do we still hear news reports of people getting shot accidentally by dropped firearms then? Well, in the majority of such cases, the firearm in question usually turns out to be an older model firearm, which doesn't have drop safety devices built in. In extremely rare cases, the firearm has a malfunctioning drop safety device. 2. Handling one gun is good, handling two is even better. In quite a few movies, we see the hero or heroine bursting out from a door with two guns, one in each hand. This scenario is also played out in certain videogames (such as the Tomb Raider series with the Lara Croft character). Sometimes the character aims them both at the same target and sometimes they are pointing at different targets. Angelina Jolie playing Lara Croft in the movie Tomb Raider. 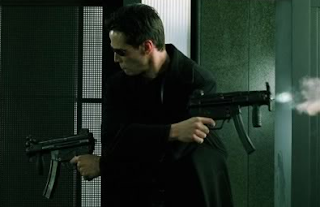 Click on image to enlarge..
Keanu Reeves playing Neo in the movie The Matrix. Click on image to enlarge. Note that Neo doesn't even bother to look where he's shooting! 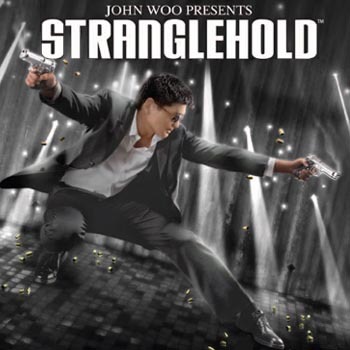 In fact, director John Woo has made it his trademark and the scene appears in several movies that he has directed, often starring Chow Yun-Fat. In fact, in the movie Hard Boiled directed by John Woo and starring Chow Yun-Fat, the commanding officer says, "Give a guy a gun and he's Superman, give him two guns and he's God!" So what is the truth here? Well, it looks pretty awesome in the movies, but it isn't such a good idea in real life. For one thing, each firearm requires one eye to aim it properly, so while it is hard enough to aim when the two firearms are pointing mostly parallel to each other, it is pretty darn hard to do it when the two are spread apart and pointing at different targets! On top of that, most modern shooting stances, such as the Weaver Stance, Chapman Stance, Isoceles Stance etc. 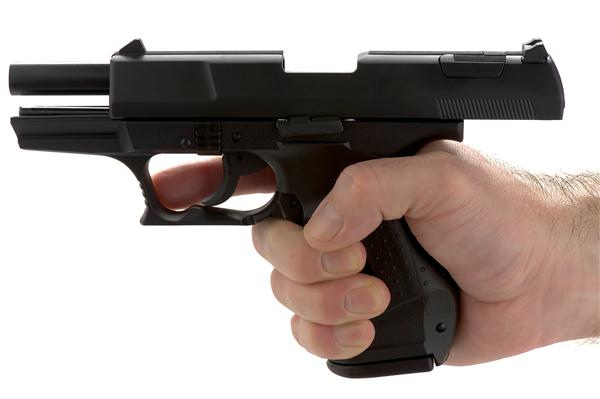 emphasize using both hands to aim a single firearm, in order to stabilize it better. 3. The hero or villain doesn't know that his pistol is empty. This scene has been replayed in several movies that it is almost a cliche: One character aims his pistol at another person and squeezes the trigger and then all you hear is "click". Curses, the character had fired off so many shots that he didn't realize that his pistol was out of ammunition. For even more drama, the character usually pulls the trigger several times while the other person laughs at him. Classic scene from the James Bond movie Dr. No, starring Sean Connery as James Bond. After the last shot is fired, the slide locks back in the rear of the pistol, the barrel is exposed and the ejection port is left open and it stays open until the user inserts a new magazine in and releases the slide back manually. In many pistols, you can't even pull the trigger when it is open like this. It becomes pretty obvious to the user, as well as everyone around him/her, that the pistol is out of ammunition. As you can see in the movie clip of the movie Dr. No shown above, the character of Professor R.J. Dent pumps six bullets into the pillow on the bed and then his pistol slide correctly locks open at around 0:09 into the movie clip when he runs of of ammunition. Then after a little while, when he attempts to shoot Mr. Bond a second time at around 1:02, his pistol slide seems to have returned back as though it was loaded, thanks to a little Hollywood movie magic. In reality, the slide should have stayed open and it would have been fairly obvious to him as well as James Bond that he was out of ammunition.